Symthic Forum was shut down on January 11th, 2019. You're viewing an archive of this page from 2019-01-09 at 01:05. Thank you all for your support! Please get in touch via the Curse help desk if you need any support using this archive. Well the rational part of my mind is conscious of the fact that it's not as easy as it sounds. Whether it's TDM or CQ large, 16 players or 64 players, the game code is the same, the servers are the same. But I do wonder a little bit why, since they tried, in the beginning at least, to push BF4 as a competitive game (including adding the defuse game-mode), they didn't try to improve the "netcode" for certain game-modes. Or at least add LAN support for this very purpose. Heck they could have went a different route with "premium" servers, designed with competitive play in mind. More expensive but performing better over-all. Has anyone had the experience post naval strike patch on PC where you clearly kill a guy and it says you killed him, and then your screen flashes and a split second later you die, and the guy you killed is now alive? Happened to me, and i saw someone else in another match (don't remember if it was the same server or a different server) report a similar thing. Was very strange. On the other hand thre are plenty of times where there is one guy on the server who I just can't kill, because as soon as he pops around a corner in my screen I am dead. What you see on your screen should have a delay slightly higher than the round trip time between your client, server and his client, latency makes players getting out of cover seem to have high reflexes while getting people killed after turning corners. However, sometimes I will have <50 ping, my opponent has <50 ping, and I have no chance in hell of killing him. Anecdotal evidence, I know, but it does happen. I am the fourth guy, The-Bronin. As you can see, I have quite a lot of games played on this server, coming in at the 4th player ranked by score. The guy on the second place, has some of the most horrid hit-detection that I have seen, and got called a hacker all of the three times that I saw him on the server (quite unlikely, as he wasn't exceeding a 2 k/d). I witnessed "one-hit" deaths against him constantly. Hey, I just wanted to point out that most of what happens in BF4 in terms of lag compensation is not only vital for smooth gameplay, it's also done by just about every other multiplayer game out there. The difference being, the negative aspects of BF4 hit detection are normally associated with high pings on other games. From what I have observed, if you take your ping, and add 100 to it, that is the ping ping/latency you'd need to have on other games to get that kind of effect. So if you have a ping of 30, that's 130 ms latency, which is playable on a server-side hit detection game. If you have a ping of 100, that's a latency of 200, which isn't playable. In BF4, hit detection is client-side, which means if you see a person, and you shoot him and hit him on your screen, your PC tells the server you got a hit. The server then decides if you actually could have hit him based on things like whether you should have been dead, then tells the person you shot that actually you did hit him. That means things are dependant on what your machine sees, not what is actually true for the server. Server side hit detection on the other hand, logs player positions and remembers them for up to a second (in the case or source), and when you fire your gun, you tell the server where you fired and what angle you fired at, and the server takes that information, moves the players positions back to where they were when the shots were fired, checks for a hit, then tells the player they got shot. Each has it's drawbacks. Server-side is very intensive computationally, but it's not dependent on the player's simulation of the world (which is susceptible to lag and hacks). It's also got a slight degree of positional error, due to accuracy limitations with time and interpolation. Client-side hit detection distributes computation over everyone's machines, and doesn't need fancy dialing back of positions. Also, theoretically, whatever see on your screen is actually there and can be shot at. There's meant to be more accuracy with hit-boxes for the shooter. Quite why BF4 doesn't operate this way is beyond me. Also, I believe client-side causes latencies to add together. Say you are being shot at. Your ping is 30, and your shooters ping is 100. It takes your packet 30 ms to get to the server, and another 100 to reach the client, so to my understanding, his "worldview" is 130 ms out of date, which means when you go round that corner, he can still shoot at you for 130 ms. Even though he's the laggy one, because it's his view that matters, he can still send the server hits. Extra latency is imposed by the low update rate I think. If the update rate is 10 Hz, that's a theoretical max extra 100 ms delay per client. How all these latencies add up IDK, but it could be horrible. What really intrigues me is just why BF4 feels so much nastier than BF3 did. Sure BF3 had dying round corners at times, but it still just feels so much better. 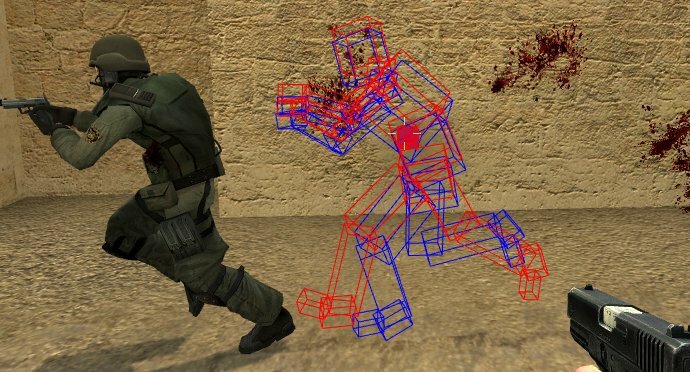 The nice model represents where the client sees the target player now, the red wireframe shows where the client saw the targets hitboxes 200 ms ago when the shot was fired, and the blue wireframe shows where the server says the target was when the shots were fired, based on rolling back the clock. The red and blue boxes don't match perfectly, because it's server side, and because the lag is so high, the target has moved significantly by the time the hit message actually gets to him, so on a 200ms ping in Counterstrike, you can die round corners. but the bigger question is : why to some it's the opposite? i died behind corners every single time in bf3(can't show becausei uninstalled it anyway) while in bf4 i nearly ever die behind them,and if i do,it's most likely due to my ping(30-50) which would be enough to be cause a "death just before i got behind cover" by common lag. I was pointing out that latency gives players getting out of cover an advantage over you while giving you the advantage against people running for cover with latencies affecting how much noticeable this effect gets. I wonder why all of you never ever mention the killcam. You all take for granted that the display in the killcam is precise, so he "couldn't have shot me" from that angle. In games with a killcam this is always a highly frustrating thing, in games without that 'feature' it is usally much less rage inducing. I mean, less people rage about "this shot was impossible, damn you %Â§$"Â§ whatever" because they get no (imprecise?) camera repetition. My theory: remove the killcam as is, go back to BF3 style, most people will suddenly stop noticing/complaining? Yeah keep in mind, the killcam is not instantaneous, nor is it showing the real line of sight between you and your killer, at the time it comes up. I guess most of it, though I agree it is more frequent than in BF3, is just illusional. And of course in most cases, from the shooters POV it will almost always be fine. As people said before, maybe a foot was showing, still, or you were not quite in cover at all.